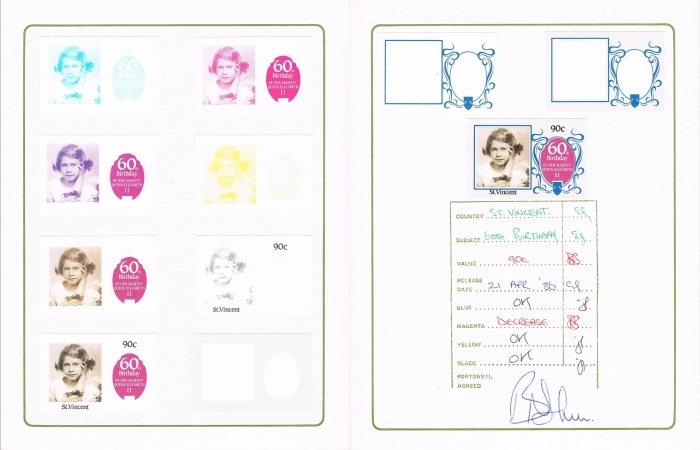 Dangerous modern forgeries of this issue appearing first in 2015 are on the market. Fake perforated and imperforate stamps are on the market! 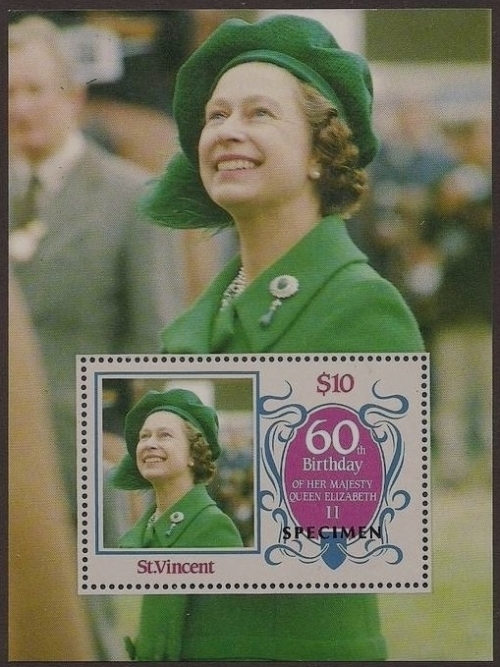 The Saint Vincent 1986 60th Birthday of Queen Elizabeth II Stamp Forgeries. The 1986 60th Birthday of Queen Elizabeth II stamps issued for Saint Vincent are a beautiful set and very colorful. This is an image of the advertisement made in the Urch Harris Commonwealth Stamp Catalog made back in 1987-88 for the 1986 Saint Vincent 60th Birthday Stamps and Souvenir Sheet and varieties. Noting that some values can still be purchased in full panes of 25 in bulk. Pricing should run at $3-5.00 for a set. 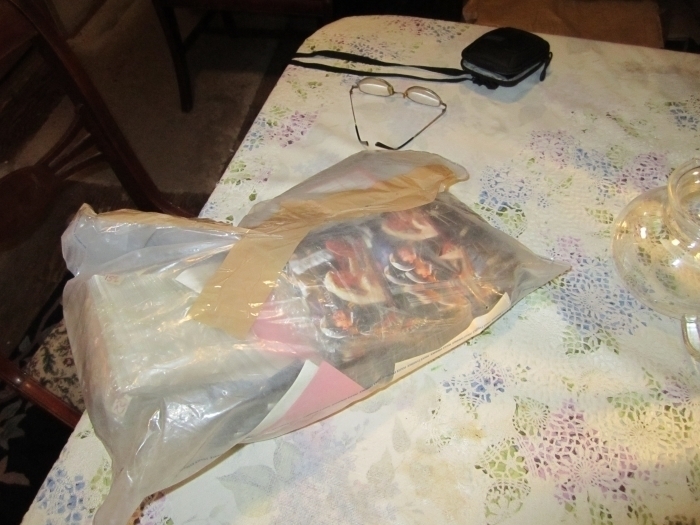 These were sold recently from the Saint Vincent police evidence stock in panes and large blocks in many lots on eBay. This shows that all were basically retained. 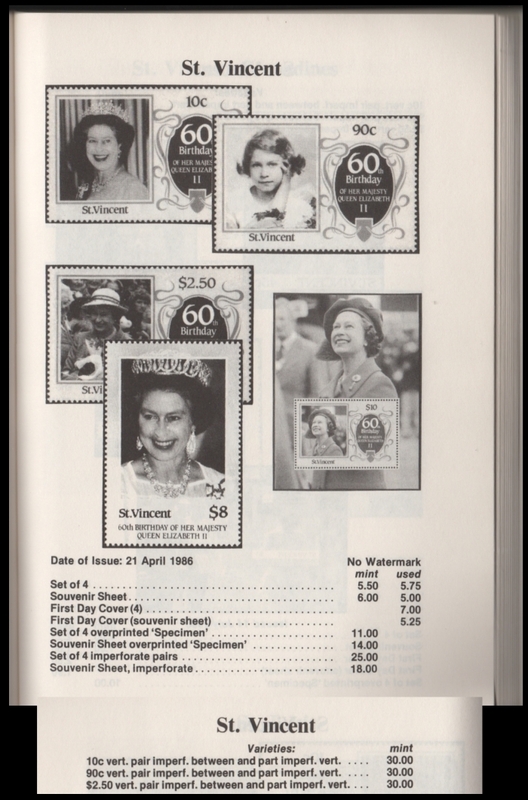 All the values exist with stamps imperforate on three sides. This differs from the advertisement above. There is no documentation on the quantity produced for this variety but judging from documentation on other issues I state firstly that the standard practice for the shifted perforation variety is always for 3,000 stamps. This imperforate on three sides variety is an oddity as I will show you in the next imaged variety. I believe that the production of this variety followed the same basic printing practice that 3,000 stamps were produced thus 120 panes of 25 stamps. 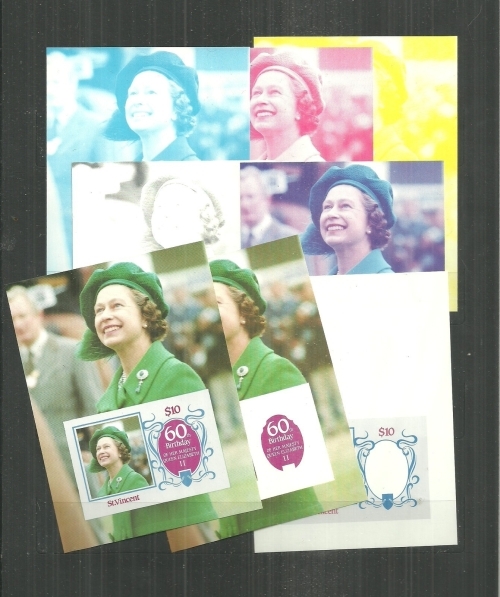 This would produce 600 imperforate on the three sides stamp varieties. 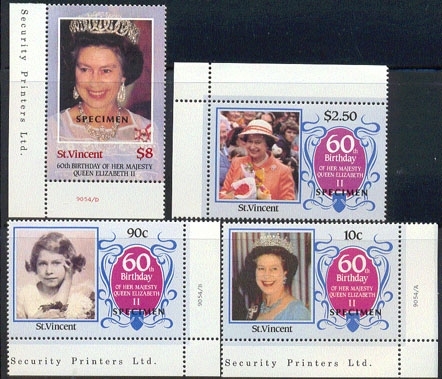 Only one row of 5 stamps on each pane were produced with this variety. 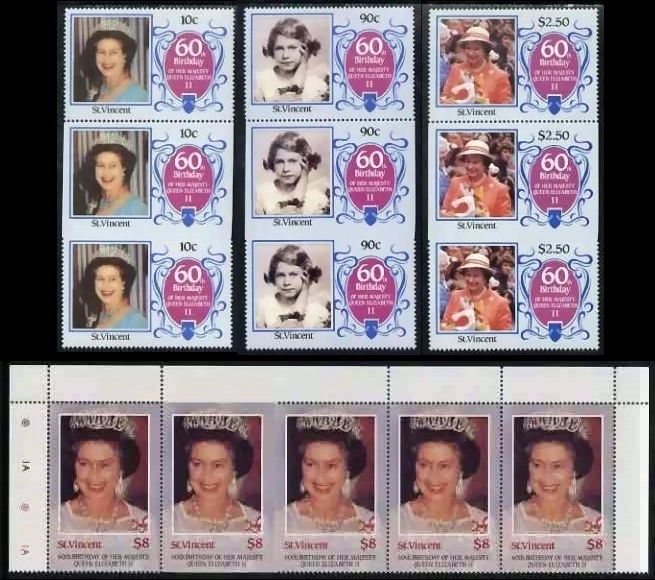 Because of the positioning of the stamps on the panes these are sold usually in strips of 3 to prove they are imperforate otherwise one could just cut off the perfs to create a false effect. This is an example of the actual shifted perforations variety. These are readily available in various locations on the market. Presently at overinflated prices. They can be bought in bulk showing they must all have been retained. Pricing should run at $5-7 a set. 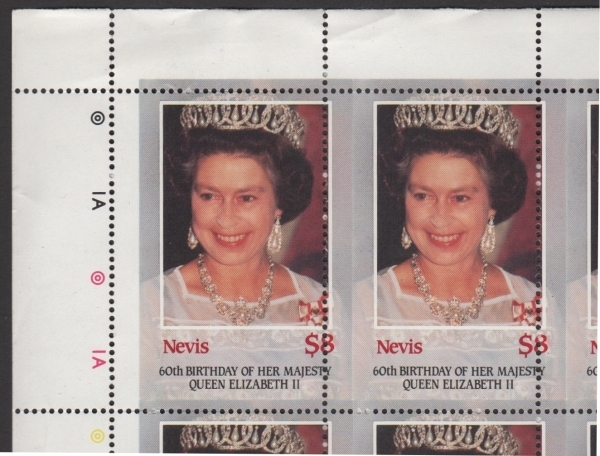 Pairs are preferable or stamps with selvage as they are more provable to be authentic imperforates. At present aside from the above imaged folder and the $8 value as such it appears nothing is out there! Standard practice was to print 3,000 sets of the progressives. It is possible they were in the Saint Vincent side of the police evidence stock and have not been presented for sale...yet which is odd since the specimen overprinted panes have been sold from the same stock. Possibly they too may have been destroyed. Time will tell. Another 1,500 were produced with the progressive color proofs. I have acquired around 2000 via the police evidence. These are available on the market at various locations. The imperforate variety is available on the market at various locations as is the perforated variety. In accordance pricing should be around $10-15.00 each considering rarity and the probability that most have been retained. I have acquired only around 25 sets of the above imaged via the police evidence. It is probable almost all the rest are lost forever. No yellow stages were found. As stated earlier I found around 2000 of the finals. I found that one seller on eBay based out of Latvia did have a set which is imaged below. It is possible they have more but this one set was sold some time ago and this seller usually relists such within weeks if he has more. 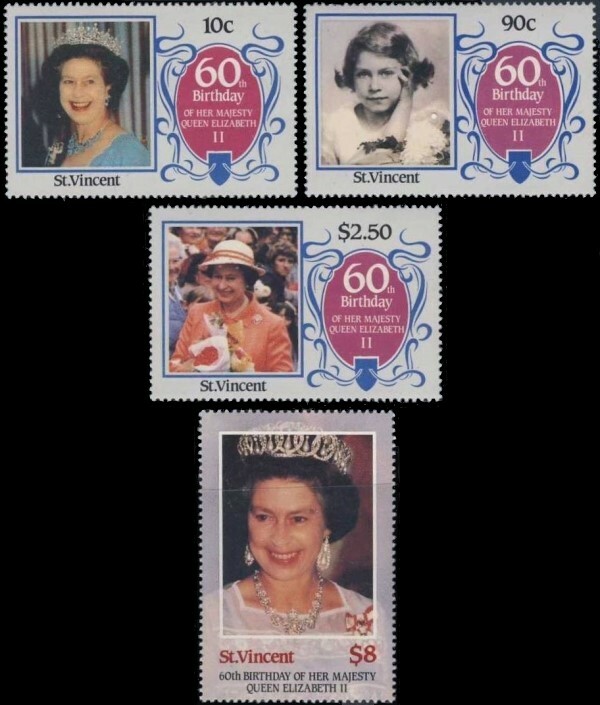 One Royal Wedding set I purchased from him was never relisted and he stated to me he had no more therefore you can see getting your hands on these is most difficult unless you are lucky enough to spot it at the right time. I note this set was missing the 8th stage. You may have noticed there are two all colors proofs on many sets. This is because the full progressive color proof set has 9 stages. The eighth stage is the black addition. The first set imaged contains the 8th stage of which I found the one partial pack. Many progressive color proof sets from many different issues have been and are being sold without this stage present thus they are not complete sets. The imaged set sold on eBay is a good example. 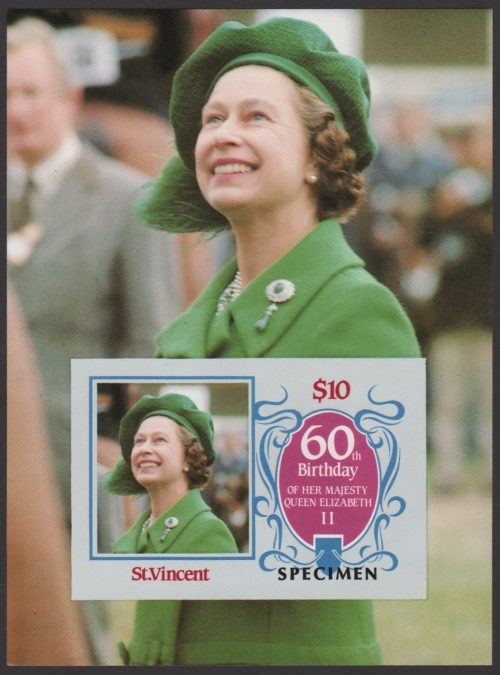 I have also noticed that the final color progressives for other country souvenir sheets are sometimes being sold as an error as it does not have the inscriptions. This is not correct. It would only be an error if it was perforated. 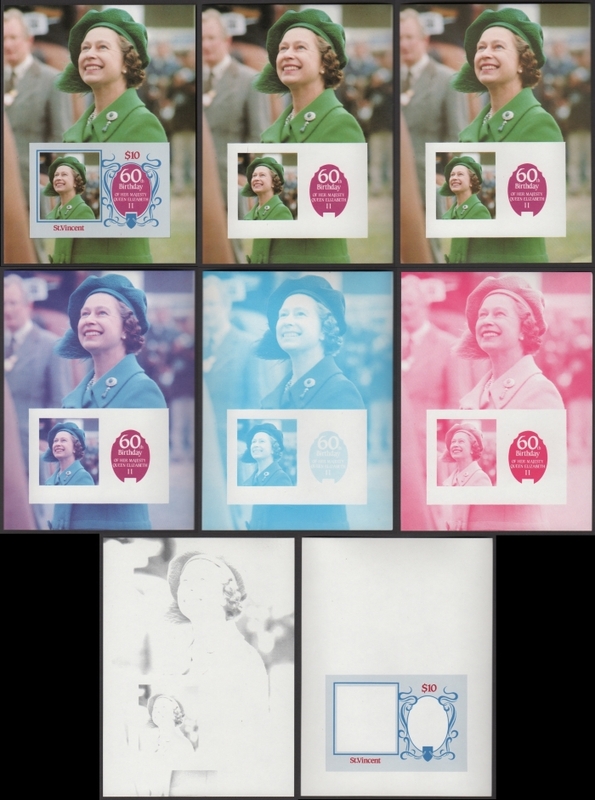 This basically sums up the stamp varieties for the Saint Vincent 1986 60th Birthday of Queen Elizabeth II Omnibus series. As new information and evidence is found it will be added to this page.